There are about hundred billion neurons in the brain. Like trees in a forest, neurons have various shapes and metabolisms, but they all share some basic features. A neuron has three main parts: dendrites, a soma, and an axon (Figure 1). The dendrites resemble branches of a tree. They join the soma, which, like a tree’s stem, is the central, bulky part of the neuron. 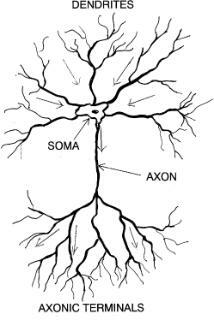 Similar to a root that leaves the stem, a single axon leaves the soma, and divides into a hierarchy of axonic branches. Apart from this visual resemblance, a neuron is nothing like a tree. A neuron is an electric relay. Pulses of electricity travel in the dendrites towards the soma. (Arrows in Figure 1 indicate the directions of the pulses.) The soma collects those pulses and adds them up, and if they pass a certain threshold, the soma sends its own electric pulse down the axon. This pulse spreads to all the axonic branches. When the soma relays such a pulse, we say that the neuron fires. Otherwise, the neuron is at the quiet state. Sensory neurons have sensors at the tips of their dendrites. The sensors convert external stimuli to electric pulses. Each type of stimulus has its specialized sensor. For example, when pressure is applied to the skin, it activates pressure sensors, which send electric pulses down their dendrites. When light enters the eye, light sensors in the retina send electric pulses through their dendrites to their somas. Sensory neurons are found in the peripheral nervous system. The vast majority of the brain’s neurons, though, are inter-neurons. Inter-neurons do not have sensors. Instead, axons of other neurons are connected to their dendrites. Firing of those axons induces electric pulses in the dendrites of the inter-neurons. The connection between two neurons, a source and a target, is called a synapse. A synapse is a narrow gap between an axonic terminal of the source and its target, usually at the surface of a dendrite. As the source fires, the electric pulse reaches its axonic terminals and causes vesicles in them to release chemical compounds, called neurotransmitters. The neurotransmitters cross the synaptic gap to the target neuron. If enough of them have crossed, they would generate a new electric pulse in the target. The new pulse propagates to the soma, where it is collected. The intensity of a pulse as it starts its propagation in the target neuron depends on the efficacy of the synapse by which it was relayed. Different synapses may release different amounts of neurotransmitter. This property is referred to as the synaptic weight. The higher the synaptic weight, the higher is the efficacy of the synapse. Several dozens of neurotransmitters have been identified in the brain. Usually, every neuron releases a certain neurotransmitter. However, a neuron may receive various neurotransmitters, and integrate their contributions. Some neurotransmitters reduce the intensity of the new electric pulse, or even prevent its formation altogether. These are called inhibitory , whereas the others are called excitatory. Overall, the brain consists of networks of neurons that send electric pulses to one another. The electric pulses that flow in the neural networks have two purposes. First, they represent information, and by manipulating them, the brain processes its information. Second, a group of neurons, called motor-neurons, have axons that connect to muscle units and to glands. Firing in the motor neurons activates their muscle units and the glands. So, the electric pulses that the motor neurons send trigger all our physical activities. Everything that we sense, feel or do, consciously or unconsciously, is represented by groups of firing neurons. In this respect, the brain is like a huge control board of a plant. At any time, different light bulbs are lighted. Those lighted patterns represent what processes are taking place in the plant. Consider an event in which someone touches you on the shoulder and you turn your head in that direction. First, pressure sensing neurons in the touched area fire. Each of them is a representation of its touched spot. Their pattern, as a whole, represents the entire touched area. That information passes to intermediary neurons that evaluate the situation. Different groups of those firing neurons represent concepts that the brain uses in the evaluation process. For example, a group of firing neurons represents the ‘novelty’ of the touching. Another group represents the concept ‘need to find more information about the touched area’. Eventually, pulses reach the motor neurons that fire and elicit a response. Each firing motor neuron represents its activated muscle unit, and their entire pattern represents the turning of the head.